Feb Club is a challenge for seniors to attend senior-organized parties and drink every single day of the month of February. That’s right, every single day. Feb Club originated in . . . actually, here’s a link to a YDN article if you really want to know the whole story. You didn’t come here for a history lesson. You came here to be entertained and/or to procrastinate properly. History does not make for a proper procrastination break. Feb Club All-Stars are seniors who have gone to every single one of the Feb Club parties. 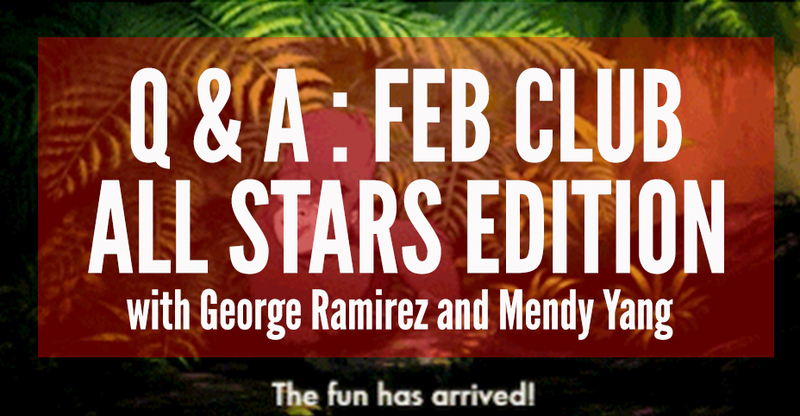 The Boola interviewed Mendy Yang and George Ramirez, two All-Stars of the Class of 2015, to find out what it was like. Favorite Drunk Food: Wenzels… quick and easy. Party or Darty? : The art of the darty is one that takes skills to master, and I have come to appreciate such artistry this past month. Darty fo’ sho’. Alyssa: When did you know you were going to be an All-Star? Did you decide freshman year that you wouldn’t miss a single Feb Club event, or did it just happen? George: I believe that I was born with a gift. That gift is called ratchedemia. It is the ability to both work hard as much as you play hard. Circa freshman year as I finished Physics 261 problem sets after Woads, I realized that I was #blessed with such a gift. It was at that moment when I realized that I had the capacity to do anything I set my mind to. I knew early on that I had the desire, discipline, and dedication, but it wasn’t until recently that I accepted that I would be an All Star. Mendy: It just happened! Although I did decide in the first semester of senior year. A: What makes one night’s (or day’s) party better than the rest? Basically, what does a good Feb Club party entail? G: A good Feb Club party convinces you to turn up when you think you had decided you were only going to go for a beer, take a picture, and leave. My best nights were those Sundays and Tuesdays where I thought I would only spend a few minutes and eventually turned into rounds of Civil War and turning up galore. M: Feb Club parties are more fun when you meet more people/actually have a chance to socialize. A good game of pong also can’t hurt. A: Did you drink at every party? G: At least one drink. You’re not a true All Star unless you commit. A: Did you meet new people at Feb Club? G: To my surprise, I developed a strong bond with my fellow All Stars. Some faces became familiar, and eventually, we developed a sort of solidarity and support system for each other. Our hosts, especially those in DKE and SigNu were especially friendly, and it was a pleasure getting to meet such nice and outgoing people that were about the Feb Club cause. A: Will you actually spend time with them now that February is over? M: Yes! One of my pet peeves is the whole “let’s get lunch” thing never ending up happening. G: I will say that my fellow Feb Club All Stars and I have a huge void that can only be filled with more debauchery. So, chances are that you’ll see us around campus dartying or frequenting Woads and other such fine establishments of ratchetry. Either that or drinking a side beer as we finish our senior projects. A: Did anything take a backseat to your Feb Club quest? Like classes? Or extracurriculars? G: Surprisingly, February of 2015 has been the most productive month of my Yale career. I’ve written over 40 pages of my senior essay, performed with teams, and finished papers earlier than expected. If anything, Feb Club has inspired me to be more efficient with my life. A: Does your life now feel more complete or meaningful with this title bestowed upon you? G: The life of an All Star is almost like reaching nirvana. Anything feels possible, and everything feels right. Again, I knew from the beginning that I had the capacity to be an all star, but now that it’s over, I feel accomplished and proud of everything this fine institution has taught me about #goinguponaTuesday and all that ish. Basically, I feel like a champ. M: I think it’s less about the title and more about the experience. All-starring guaranteed that I got out of my room every day, which was actually really fun and a great way to spend senior spring! A: People criticize Feb Club for basically everything. What is the criticism that you heard the most and what was your response to it? M: I actually haven’t heard too much criticism directly. I guess one thing that comes up is “the parties are super lame.” Okay, not every night was a wild rager, but it’s really less about the drinking and more about both getting to know old friends who went to Feb Club with you and the new friends that you met every night. G: I don’t really fux with Yale and much that it has to say about anything, so I didn’t even know people had negative feelings about Feb Club. Gotta let the haters hate. That is all. A: What is your one takeaway from the entire experience? M: The class of 2015 is pretty damn cool. G: Everything I do, I do for the diaspora. I’m glad I was able to represent my people throughout this experience. We’re here, and we’re here to stay. A: Since you guys are on the downhill out of college, what do you have to say to all of the underclassmen still climbing uphill? M: Yale gets hard sometimes, but at the end of the day, take a moment to think about what you will really remember 5, 10, even 50 years from now. Then actually make it a point to go and do those things. You are in control of your own luck and happiness! G: It only gets better. Turn up!